Scary Terry's World: For those who came in late... the unseen Phantom! 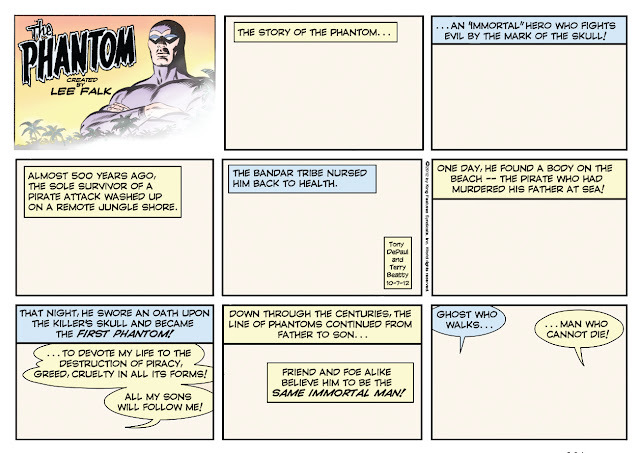 Today's Phantom strip has an interesting back story. Yes, it's a retelling of the character's origin -- something that's been done in the strip many times over the years -- often with the introductory caption "For those who came in late," but today's strip was originally intended to have a very different twist. October is National Arts and Humanities Month , which King Features thought was something worth noting. I agreed. The notion we cartoonists were presented with was to do a Sunday strip without any artwork. The tagline added to all the strips would be something like "Imagine a world without art" -- followed by some official logo and/or link to more information about Arts and Humanities Month. No strip would be obligated to participate -- strictly a volunteer thing. Our writer, Tony DePaul, had originally nixed the idea of taking part, as a new story would be just starting, and visuals were needed for that first page. 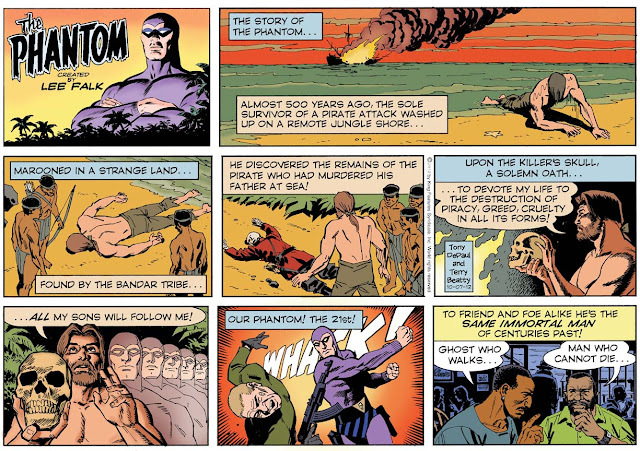 But I pointed out that the timing was just right for The Phantom -- The Power House Gang story would have just ended, and we could simply delay the beginning of the new adventure to the next week -- and do our stand-alone "artless" strip this Sunday. I suggested we do the Phantom origin. Tony agreed and quickly wrote the new strip. I designed it, and turned it in -- minus the official A&H Month tag, which was still under discussion. Here's the "artless" strip as intended to be published today. But this didn't appear in any newspapers today -- and the only place you'll see it is here on my blog. It seems that not enough other strips decided to take part -- and so the promotion for the event was cancelled. Of course we couldn't have this be published this way then -- and I'd already drawn the next few strips, all dated and delivered. So I had to add art to this artless comic strip. Which wasn't quite that simple, since this had been written for no art -- and the copy was too heavy to leave (much) room for any drawing in several panels. So Tony did a rewrite to allow room for some imagery -- and, for the first time, I got to draw the origin of The Ghost Who Walks. So while we didn't get to promote the month long Arts and Humanities event, we did get to do a fun stand-alone strip. I referenced previous versions of this from various Phantom artists, and paid homage to those (sometimes contradictory) versions with a few of the panels. I had a good time with the color, selecting hues from vintage printed strips to make for a "warmer" look to the flashback panels. I think Phantom fans will consider this one a treat -- and of course, next week, it's a NEW ADVENTURE! Love your work on this Phantom strip. Used to read it in my newspaper as a kid, then by Falk & Barry. They'd love your work on it. When will the art for this one be on sale? You should do a run of 250 posters of this strip, it looks great! The original art for this one has already been claimed by a Phantom collector.